Rory Lewis JD PhD, Machine Learning, Artificial Intelligence, Artificial Consciousness, University of Colorado Colorado Springs, Computer Science, Bachelor of Innovation, United States Air Force, Pentagon. Abstract. The central aim of this paper is to test and illustrate the viability of utilizing Rough Set Theory to visualize neurological events that occur when a human is thinking very intensely to solve a problem or, conversely, solving a trivial problem with little to no effort. Since humans solve complex problems by leveraging synapses from a distributed neural network in the frontal and parietal lobe, which is a diffcult portion of the brain to research, it has been a challenge for the neuroscience community to functionally measure how intensely a subject is thinking while trying to solve a problem. Herein, we present our research of optimizing machine intelligence to visually illustrate when members of our cohort experienced misunderstandings and challenges during periods where they read and comprehended short code snippets. This research is a continuation of the authors' research efforts to use Rough Sets and artificial intelligence to deliver a system that will eventually visually illustrate deception. ISMIS 18 Cyprus. Springer Paper. Video, Video , Video . R. Lewis, C. Mello, Y. Zhuang, M. K. -C. Yeh, Y. Yan, D. Gopstein. “Rough Sets: Visually Discerning Neurological Functionality During Thought Processes.”The 24th Int. Symposium on Methodologies for Intelligent Systems, (ISMIS ‘18),). 29th – 21st October, St. Raphael, Limassol, 2018. Aug 7, 2018 PART 1 of 3 :: One instance of temporal duration versus Riemann integral during 0.333 secs. R. Lewis, C. Mello, Y. Zhuang, M. K. -C. Yeh, Y. Yan, D. Gopstein. “Rough Sets: Visually Discerning Neurological Functionality During Thought Processes.” The 24th Int. 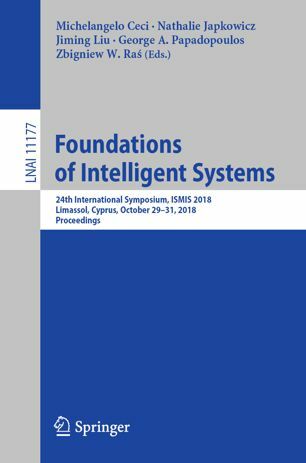 Symposium on Methodologies for Intelligent Systems, (ISMIS ‘18), 29th – 31st October, St. Raphael, Limassol, 2018.